Traditional wedding anniversary gifts are chosen from a list of materials that are designated for each year of a couple's married life. The first wedding anniversary is symbolized with paper, and from there, traditional anniversary gifts become more precious or scarce to reflect the growing number of years a couple has remained together. If you look at the list, you will notice that it isn't until the 25th wedding anniversary that it seems that jewelry is clearly introduced with "silver" as the material. However, you don't have to wait that long to incorporate a piece of jewelry into a traditional anniversary gift. Your spouse might be a big jewelry fan. 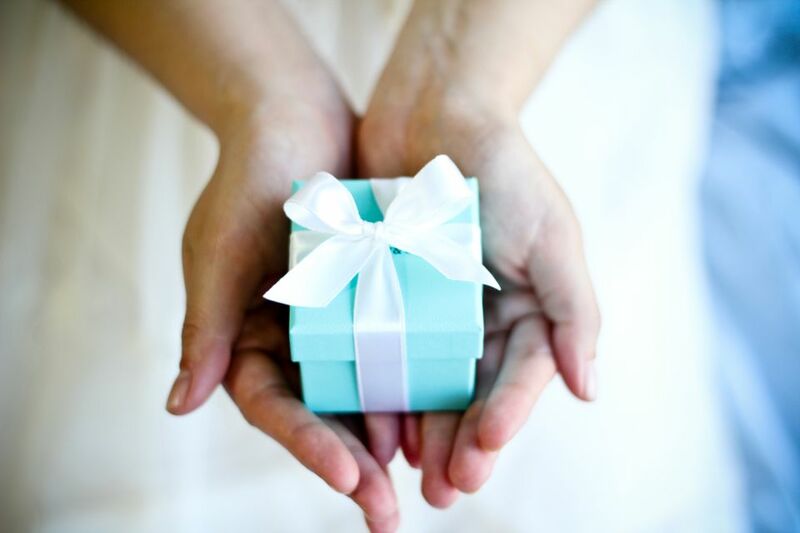 There is no hard-and-fast rule that says you cannot deviate from the tradition or even, incorporate the tradition, into an annual jewelry gift. You can celebrate the yearly tradition even if you want to break away from it by making your anniversary year's theme material a carrier for your gift instead of the actual gift. You can also find antique or hand-designed jewelry made in iron (6th anniversary), copper (7th anniversary), bronze (8th anniversary), tin (10th anniversary), steel (11th anniversary), and ivory (14th anniversary). As of the 25th year, it gets easier. In the later years, the material theme items get more and more precious, such as silver, pearls, rubies, sapphires, gold, emeralds, and diamonds. Diamonds are traditional wedding anniversary gifts in both the 60th and 75th years. Year 60 probably became a part of existing traditions when Queen Victoria celebrated her Diamond Jubilee after 60 years on the British throne. No one is certain just when the traditional anniversary gift list came into existence, but it probably evolved over time. Calling 25 years the silver anniversary and 50 years the gold anniversary may have originated in medieval Europe; wives were given a silver wreath to celebrate their 25th year of marriage and a gold wreath for their 50th wedding anniversary. Along with the traditional "materials" gift list, there are also two other lists you should know about: the anniversary flower list as well as an anniversary gemstone list (perfect for jewelry lovers). The first-anniversary material is paper and the second is cotton. You are not going to go out and buy a ream of paper or a box of cotton balls, but you can come up with unique ideas to tie in the theme and make it sentimental for you and your beloved. You can make a paper origami booklet or box folded in a shape that's special to the recipient. To incorporate jewelry, tuck it inside the origami shape. Ivory is traditional for the fourteenth anniversary, but the newest ivory cannot be imported to the U.S. You can find items made from vintage ivory like antique cameos. However, if you're among those who do not want to own the material at all, you might want to consider ivory alternatives made from nuts, seeds of palm trees, and other vegetation. Or, get exotic and plan a trip to Africa and see an elephant's ivory tusks in person on a safari. Or, go to Disney World and ride the Dumbo the Flying Elephant ride. If time or budget is a constraint, then visit a local zoo that has elephants or get a first-edition "Babar" or "Jungle Book" as a nod to those fictional elephants. Coral is the material from the 35th year. It is considered an "organic gemstone." It isn't as protected as ivory, but it is another item that many people do not think should be removed from nature. Formed over time from the exoskeleton of living polyps, this material has been used to make jewelry for several millennia. It has been found in ancient Egyptian tombs as a precious jewelry material. As a wonderful alternative for your thirty-fifth anniversary, give your spouse diving lessons to see coral up close or go to a destination famous for its coral reefs.